The Lake Tahoe Basin is especially vulnerable to Aquatic Invasive Species. The lake’s ecosystems have been altered in recent history, by the introduction of non-native, invasive species of both plant and animal; Curlyleaf Pondweed, Eurasian Milfoil, Smallmouth Bass Catfish and Asian Clams to name a few. In 2007, Asian Clam beds were found throughout the south end of Lake Tahoe. Research is being conducted on how to remove and control the clam population. An EVEN BIGGER THREAT than the Asian Clam is the possible introduction of Quagga/Zebra Mussels to Lake Tahoe, which can have serious impacts on native wildlife, fisheries and ecosystems. How do they “Ride” here? The mussels are transported on infested recreational boats and commercial boats. The mollusks are not visible to the human eye in the larvae state – so a boat showing no signs of infestation can harbor or transport the larvae in the bait wells, bilge tanks, ballast bladders, or on parts of the boat trailer. Where are they now in 2009? In our area, Lake Mead, Nevada; Lake Mohave, Nevada; Lake Havasu, areas of California; and waters along the Colorado River drainage are infected. How can we arrest the spread? Do not launch any boat in Lake Tahoe or the surrounding Sierras that is wet or has been in any suspected or known area of mollusk infestation. Boaters are asked to be prepared for and cooperate with watercraft inspections at launch facilities. Click here to see flyer. What can we boaters do to help? 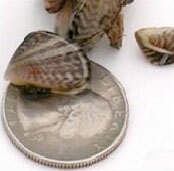 Inspect all exposed surfaces – maturing Quagga mussels will feel like sandpaper to the touch. Thoroughly wash the hull of each watercraft with hot water, once it is out of the water, removing all plants and animal material. Drain any water through the vessel’s hull plug, and ensure the area is bone dry before launching in another waterbody. Ensure the vessel’s lower outboard unit is drained and bone dry. Clean and dry any live well aboard the vessel. Empty and dry any buckets, on land. Remember, any vessel traveling from one freshwater water body to another should remain DRY and out of water for AT LEAST five days, and/or be decontaminated by hot wash and chlorine rinse! Mandatory inspections are being conducted at most public launch facilities in the Tahoe Region. Arriving at the launch site with your watercraft clean, drained and dry (live wells and ballast tanks drained, bilge plugs pulled). All watercraft, motorized and non-motorized, are subject to an inspection prior to launching into the waters of the Lake Tahoe Region to detect the presence and to prevent the introduction of Aquatic Invasive Species. Tahoe Regional Planning Agency Code 79.3.A. The transport or introduction of aquatic invasive species into the Lake Tahoe Region is prohibited. Further, it is prohibited to launch any watercraft into the waters of the Lake Tahoe Region, including Fallen Leaf and Cascade lakes, that are contaminated with aquatic Invasive species. Tahoe Regional Planning Agency Code 79.3.B. Watercraft inspections: All watercraft are subject to an inspection prior to launching into the waters of the Lake Tahoe Region when requested by an inspector. Inspections are conducted by the Tahoe Regional Planning Agency or its designee. There are currently several decontamination sites located around Lake Tahoe for boater convenience. Boats identified as high risk and/or containing water in the bilge, ballast tanks, live wells and/or engine cooling systems will be asked to decontaminate prior to launching to avoid the illegal introduction of aquatic invasive species. If you are traveling from a high risk area, you can call ahead to schedule a decontamination. 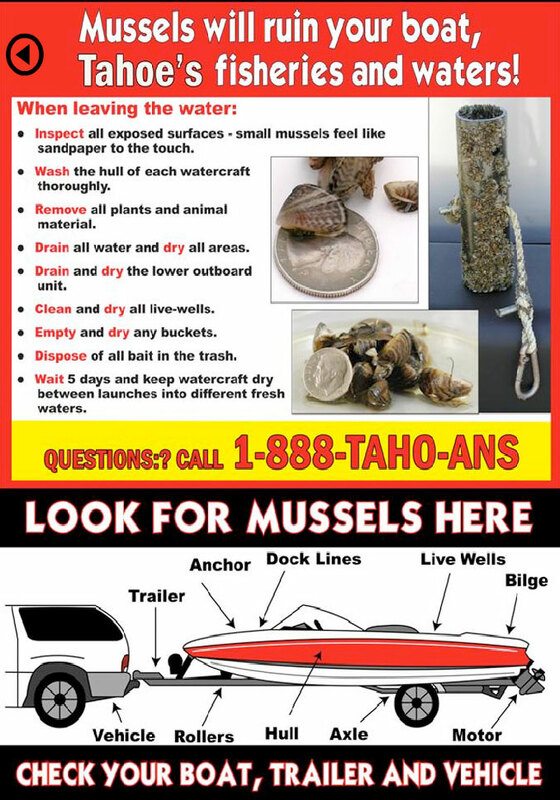 HOTLINE — Please call 1-888-TAHOANS (824-6267) to get more information about inspections, decontamination or to report any sightings of Zebra or Quagga mussles. This toll free number is available seven days a week during daylight hours.